Lo-Disc Floor Tiles have 3/4" diameter discs, raised .025"; are an economical, attractive long-wearing resilient rubber tile. Tapered discs are easier to clean. 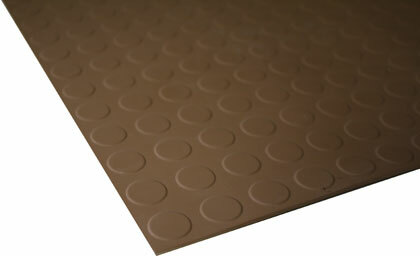 An excellent landing tile for stairways, elevators, entrance lobbies or hallways. Meets Federal Spec. RR-T-650E and ZZ-T-001237 (GSA-FSS). Install with No. 400 Neoprene Contact Adhesive or #560 Rubber Flooring Adhesive. Raised discs are 3/4" in diameter and are raised .025".